That all changes, along with her life, forever, when she unexpectedly wins a fortune on the lottery and is propelled into the realms of the super-rich elite. Everything that money can buy suddenly comes within reach for her. And while Dorothy likes the idea of being rich beyond her wildest dreams, she soon finds that it will bring its own set of problems. A set of problems compounded by her unique and amazing ability. In the old days, when she had been just plain old Dorothy, it had been easy to hide her psychic powers. But now it’s going to be so much harder. Since the age of nineteen she has been aware that a shadowy presence travels with her, providing solace and protection. When her dreams and visions start to become more vivid and frightening than usual, she wonders if any amount of money can protect her from her own gifts, or indeed the elusive and occasionally menacing figure that stalks the fringes of her mind. 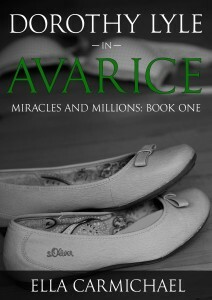 Welcome to Book 1 of the Miracles and Millions Saga. A story of hope. Be prepared for HUMOUR, IRISH MAMMIES, WEIRD VISIONS AND PROFANITY – IRISH STYLE. Not a standalone novel. This is chapter 1 in the extraordinary adventures of Dorothy Lyle and her entourage.